Anthea Missy is a French-born self-taught street artist currently living in Brussels who started exploring painting full time in 2014 after she obtained a masters’ degree in business administration. Since then, she has been combining her two greatest passions, traveling and creating, allowing the two to blend and recharge each other. Missy’s art is underlined by her personal motto of Come as you are, a simple spiritual approach to life that heavily reflects itself on both her personal style and the way she treats her work upon its completion. 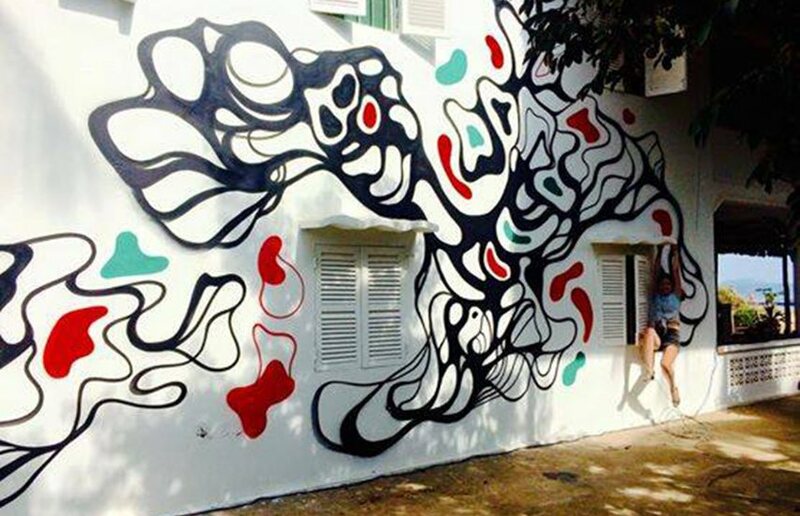 Keeping that in mind, Anthea sets to create street art atmospheres rather than send explicit and direct messages, aiming to portray the character of a certain location. Ever since Anthea Missy was a child, she was interested in drawing and collage, so these practices quickly became her hobby. When she got a little bit older, she studied business and administration instead but still had painting classes in her private time. Missy’s father was an artist himself, so he was a constant source of inspiration and encouragement to his daughter. During her student days, her communication teacher bought his young pupil some paintings and encouraged her to embrace a career driven by self-expression. Soon, Anthea Missy graduated and started working in marketing and business consulting. Although this job sat relatively well with her, Missy needed to discover the world and travel, hoping that such experiences would help place herself outside the box creatively. Soon, her travels were followed by her art expressions and Anthea has been developing her unique brand of work ever since . Nowadays, her pieces have evolved into a celebration of bold strokes that form round shapes and create asymmetric and dynamic lace patterns, often emphasizing contrasts. Her work is fluid and smooth, proudly embracing elongated lines and patterns. Anthea also searches for clarity and density with spray paint, liquid acrylics and paint markers. 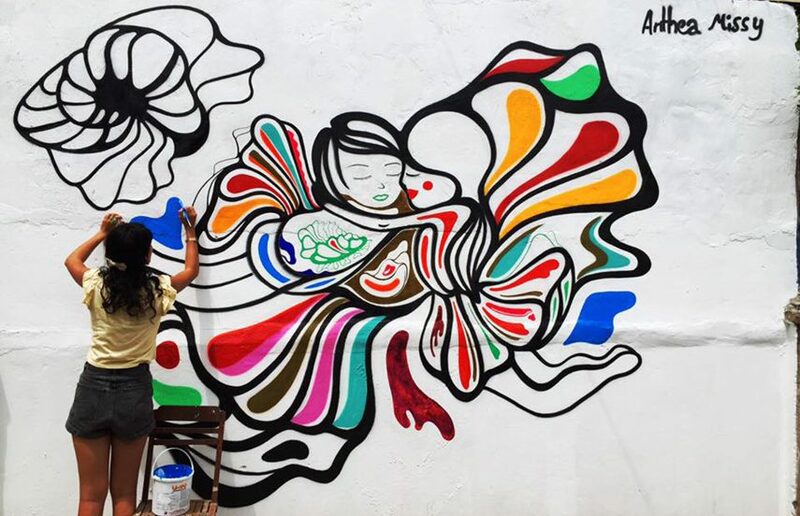 Anthea Missy finds inspiration in many different things, such as clothing and random people in the streets, but what constantly influences her art are the pure concepts of love and freedom. The latter also plays a big part in her creative process – Missy enjoys spontaneous painting, inspired by the ideas of automatic writing that were initially developed by Andre Breton in the early phases of the avant-garde art. Of course, every piece she makes is planned out before hand – Anthea just allows the moment to spontaneously change some aspects of the original plan. Inspired by the Japanese rules of art and many minimalistic concepts, the art of Anthea is all about motion and it exploits the tension of diagonals and circular patterns. As it was said earlier, her visual language owns a strong metaphysical dimension as well, one that allows the evolution towards a more tactile set of sensations. Influenced by the community engagement and numerous personal artistic endeavors, Anthea Missy spreads her art where she feels it can make a positive difference. This is evidenced by the following statement made by the artist herself: If I am able to engage the community in my endeavors, the picture becomes more than a visual, it becomes a human story. If I can inspire others to do the same, take part, support, and connect together I have met my human objective as an artist. Additionally, one should not overlook the feminine contributions Missy provides to the urban art scene. 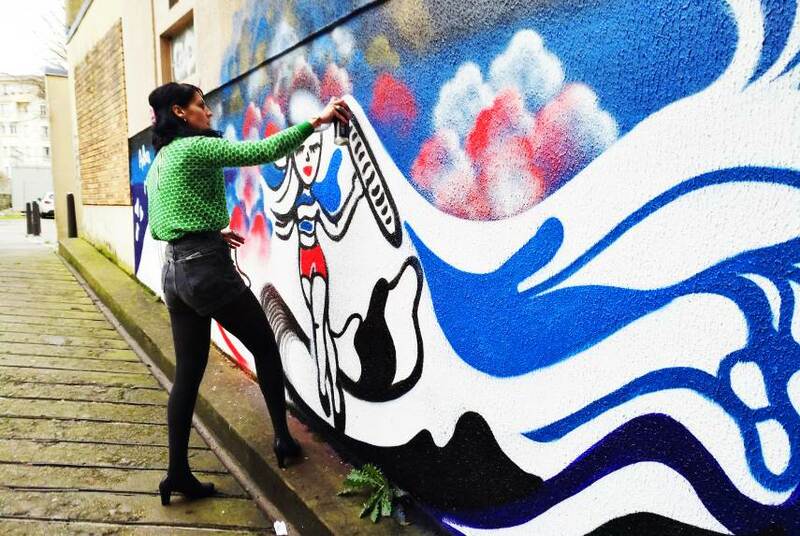 Painting with heels and shorts, scrapping dirty walls, splashing paint over herself in her adventurous urban takes, Anthea Missy seems to convey a strong feministic message about women’s role in street art. Anthea Missy lives and works in Brussels, Belgium. All images courtesy of the Addicted Art Gallery.